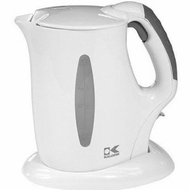 The Kalorik Cordless Electric Kettle Boil water twice as fast as microwave oven, perfect for tea, coffee, hot chocolate or instant soup. Generous 1-3/4-quart capacity with an exterior water gauge for easy measuring. A powerful 1500 watt heating element for quick boiling. The revolutionary cordless design allows the kettle to be lifted from its base and a locking lead with a unique trigger button on the rubberized handle to ensure safety and easy fill. This Kalorik kettle is a true necessity for today’s kitchen. Features: 0-1/2 gallon capacity / rubberized handle pad / strix controller / locking lid with opening trigger button.